Lyndhurst is in the middle of Hampshire's New Forest. It is home not only to hardy ponies which take their name from it, but also to donkeys, cattle and pigs. All roaming freely under the ancient broad-leaved canopy. My sister told me that at the previous dollhouse fair a pig was spotted in the car park next door. But as we parked, I only saw a donkey in a long winter coat (!) taking a keen interest in a litter bin. In 1067 William I (Normandy's William the Conqueror) created this royal hunting forest to protect the "beasts of the chase" - deer and wild boar - for his sport. Local peasants were no longer allowed to enclose their land but instead were granted the right to graze their domestic animals "free range". By eating the gorse (furze) and brambles, the horses, cattle and sheep managed the undergrowth. The pigs - and the wild boar- also effectively "rotovated" the ground with their muscular snouts - good for soil fertility! Such grazing allowed forest saplings to emerge, so that just 20 years after the French invasion this former scrubby land was recorded as forest in the Doomsday Book inventory of 1086, describing Norman (French) land conquests across England. In the 13th century Henry III (King of England but unpopular because he was absent a lot defending his vast continental empire across France and beyond ) gained some popularity amongst his English subjects by granting London citizens one free days hunting at Easter each year within a 20 mile radius of the city. Your common (no pun intended) or garden peasant was equipped with neither deer-hound, horse, nor even bowmanship skills to take down a deer but with stealth, patience and ingenuity he might have been able to bag one, or to bait and trap an unwary boar. After the dollshouse miniature show we escaped to the forest edge to have our picnic supper. Medieval things always intrude into my thoughts nowadays and we wondered about those foraging forest pigs. Was it tillage or tannage rights that were enjoyed in the New Forest by our porcine friends and their peasant owners? 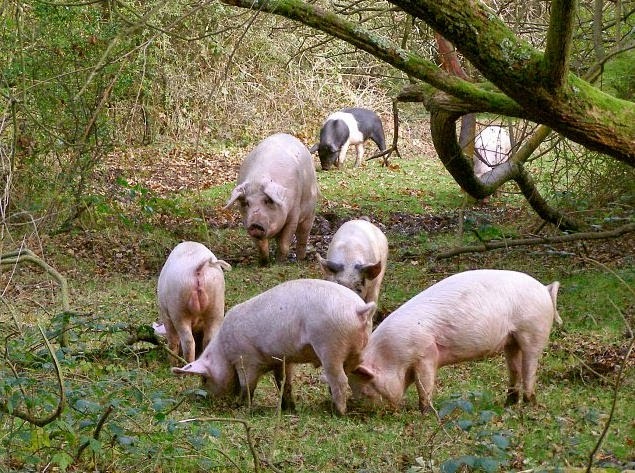 I had been doing some research on the domestication of pigs, including medieval pig husbandry, and a friend had been giving my sister the low down on New Forest commoners' rights knowing that she would be visiting the area. But still we could not remember the correct term. So I checked it out when I got home. It was neither tillage nor tannage - it was "pannage". Below is the first 12th scale porcine product I have modelled by way of a Medieval dollshouse miniature or dollhouse Tudor food. The medieval rights of a commoner still prevail in the New Forest. Explained on England's Forestry Commission website, they include: pasture (for ponies, cattle and donkeys); sheep grazing; fuel wood (fallen wood is now no longer foraged, but harvested wood is set aside on forest tracks for commoners to collect); and pannage for pigs in autumn. By this last concession excess beech nuts and acorns are removed, which in excessive quantities are poisonous to ponies and cattle. Apparently over 300 commoners exercise their medieval rights with more than 6000 animals grazing all year round, but not currently sheep! The reason we didn't see "spot a hog" was because it wasn't autumn (fall), whereas the last Lyndhurst dollhouse show was in October's autumnal pig pannage season. It all makes sense now! We watched the grazing progress of about six young cattle downslope of us. They did not trouble us, but a rather lovely short-haired dog of some exotic pedigree did make a feeble attempt to ingratiate herself and share our picnic. Returning to the cars some fancy diversionary footwork was needed to outwit three curious ponies and get into cars unscathed - it was time to go!